This article is about the Mystery Spot in Santa Cruz. For "mystery spots" in general, see gravity hill. For the Supernatural episode, see Mystery Spot (Supernatural). 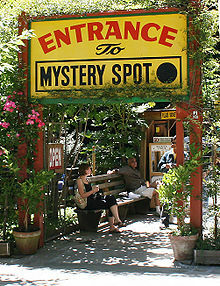 The Mystery Spot tourist attraction near Santa Cruz, California, opened in 1939 by George Prather. Visitors experience demonstrations that appear to defy gravity, on the short but steep uphill walk and inside a wooden building on the site. The Mystery Spot is a popular tourist attraction, and gained recognition as a roadside "gravity box" or "tilted house". At this roadside attraction, the laws of gravity and physics seem to disappear as balls roll uphill and people lean over past their toes without tumbling over. One of the many optical illusions at the Santa Cruz Mystery Spot. The Mystery Spot was first discovered by George Prather in 1939. George Prather was an electrician, mechanic, and inventor before he opened the Mystery Spot. He was born near Fresno and moved to Santa Cruz in 1920. He owned a welding shop and repair garage in the area before he opened the Mystery Spot. The Mystery Spot was one of several roadside attractions that opened after World War II for new automobile owners and was featured on Art Baker's television show You Asked For It. Prather was inspired to open the site by the popularity of the Oregon Vortex which opened to the public in 1930. According to a newspaper report, Prather bought 3 acres on the hill in 1940 after he felt slightly dizzy while walking and was interested in his dizziness. The newspaper also reported that during further exploration of his property he found his compass jittering. He built a "crazy house" and opened the site to the public in June 1941. The site is what is known as a gravity hill and was the first of its kind to be built in California. Tour guides lead visitors through the attraction and perform various demonstrations to showcase the site's unusual effects. Prather died in January 1946; his son Bruce inherited the land and continued running the Mystery Spot with his father's business partner Vaden McCray. The McCray family was photographed for the Life magazine spread on the Mystery spot for their November 15, 1948 issue. McCray died in 2001; Bruce Prather died in 2015. An anonymous Santa Cruz lawyer now owns the property. The Mystery Spot was nominated in July 2014 to be designated as a California Historical landmark and was officially declared as California Historical Landmark #1055 in August 2014. The site is located in Santa Cruz, California amongst the Santa Cruz mountains, Oak trees, Eucalyptus trees, near Granite Creek, and within the California Redwood forest. The Mystery Spot is home to a man-made dahlia garden along the hiking trail. The Mystery Spot is a gravity hill, tilt-induced visual illusion. The illusion experienced by visitors results from the oddly tilted environment as well as standing on a tilted floor. Inside the tilted room of the Mystery Spot, misperceptions of the height and orientation of objects occur. Even when people are standing outside on a level ground, the slant of the building in the background causes misperceptions as humans judge the height of people using the slant of the roof rather than the true horizon. These visual illusions include balls rolling uphill and people leaning farther than normally possible without falling down. Psychologists at Berkeley state that all of the misperceptions stem from the simple fact that the house is slanted at a 20 degree angle. Professor William Prinzmetal states, “When the perceiver's body also is tilted, the distorting impact on vision is greatly magnified- up to two or three times.” Another point he makes is that distorted orientation causes other senses to fall back while your visual senses become heightened. People standing at impossible angles and water flowing uphill are related to the angle at which the house sits on. Other suggestions have been proposed to explain the reason behind The Mystery Spot's odd gravitational rules and illusions. Tour guides suggest that “a meteor which fell in ancient days and left a magic circle” is the cause behind the mystery, and suggest that an electromagnetic field on the hill deters wildlife. These are theories proposed by guides for entertainment, and not scientific reasoning. The Mystery Spot is open for tours 365 days a year. Aside from the attraction itself, there is a thirty-minute hiking trail nearby. The Mystery Spot was the first 'gravity-defying' tourist attraction in California and was the most prominent illusion-based tourist attraction in California in the mid-20th century. The Mystery Spot has been featured on Buzzfeed, the Santa Cruz Sentinel, comic strips, travel blogs, and newspapers for decades. ^ Lamers, Chantal (July 22, 2007). "Gravitational tourist draw". The Orange County Register. The Orange County Register. Retrieved 9 March 2017. ^ News Advisory. Washington, DC: United States Department of Labor, Bureau of Labor Statistics, 1991. 30 July 2014. Web. 8 Mar. 2017. ^ McBroom, Patricia. "Santa Cruz Mystery Spot Explained." Santa Cruz Mystery Spot Explained. Office of Public Affairs, UC Berkeley, 09 Sept. 1998. Web. 15 Mar. 2017. ^ Bready, Lowell (June 13, 1941). "Mystery Spot - You Never Saw a Crazier Place - Opens Sunday for your Amazement". Santa Cruz Sentinel. Santa Cruz Sentinel. Retrieved 8 March 2017. ^ "Grace Anestine (Osterberg) McCray". Santa Cruz Sentinel. Santa Cruz Sentinel. May 22, 2007. Retrieved 9 March 2017. ^ "Bruce Leonard Prather". Santa Cruz Sentinel. Santa Cruz Sentinel. October 25, 2015. Retrieved 10 March 2017. ^ "2014 Annual Report" (PDF). Office of Historic Preservation California State Parks Natural Resources Agency State of California. California State Parks. Retrieved 10 March 2017. ^ Clark, Samantha (June 20, 2016). "Santa Cruz Mystery Spot at 75: the Story, the Speculation, the Science". 90.3 KAZU. 90.3 KAZU. Retrieved 8 March 2017. ^ McBroom, Patricia (9 September 1998). "Santa Cruz "Mystery Spot" Explained". The Berkeleyan. Retrieved 7 September 2015. ^ Shimamura, A. P. & Prinzmetal, W. (November 1999). "The Mystery Spot Illusion and its Relation to Other Visual Illusions" (PDF). Psychological Science. 10 (6): 501–507. CiteSeerX 10.1.1.17.5835. doi:10.1111/1467-9280.00196. ^ "Paranormal and Transcendental Experience." Google Books. N.p., n.d. Web. 19 Mar. 2017. ^ "09.09.98 - Santa Cruz Mystery Spot Explained." 09.09.98 - Santa Cruz Mystery Spot Explained. Office of Public Affairs, UC Berkeley, n.d. Web. 19 Mar. 2017. ^ Yamanaka, Sharon. "The Mystery Spot." Santa Cruz County History - Santa Cruz Public Libraries. Santa Cruz County History, n.d. Web. 15 Mar. 2017. ^ "The Mystery Spot Official Website." MysterySpot.com. N.p., n.d. Web. 19 Mar. 2017. ^ "The Mystery Spot in Santa Cruz: Altered Reality or a Clever Gimic." California Through My Lens. N.p., 16 Oct. 2014. Web. 19 Mar. 2017. ^ "In The Press | Gallery | The Mystery Spot - Santa Cruz, CALIF." MysterySpot.com. N.p., n.d. Web. 16 Mar. 2017. <https://www.mysteryspot.com/in-the-press>. This page was last edited on 20 April 2019, at 03:17 (UTC).